The pricing details have not been revealed. The Lincoln Navigator Concept was first revealed last year at the New York Auto Show and now the production model of 2018 Lincoln Navigator has been unveiled, which looks very much similar to the concept. With that said, we have noticed some minor changes; for example, the gullwing doors have been removed and it now features standard chrome door handles. The lower grille on the front bumper is also slightly different, while the taillights are a little bulky. The huge front mesh grille with Lincoln monogram, side vents on the side fenders and the large wheels are same as the concept model. The 2018 Lincoln Navigator is based on the Ford Expedition and carries a similar engine. It is equipped with a twin-turbo 3.5L V6 unit creating up to 450 horsepower. The same unit on the Expedition yields 375 horsepower. The engine is paired to a 10-speed automatic transmission system. The interior features a 12-inch display on the instrument panel and a floating touch infotainment system on the center console. The front dash also includes climate control buttons and air conditioning vents. The seats are 30-way adjustable with heating and cooling function. 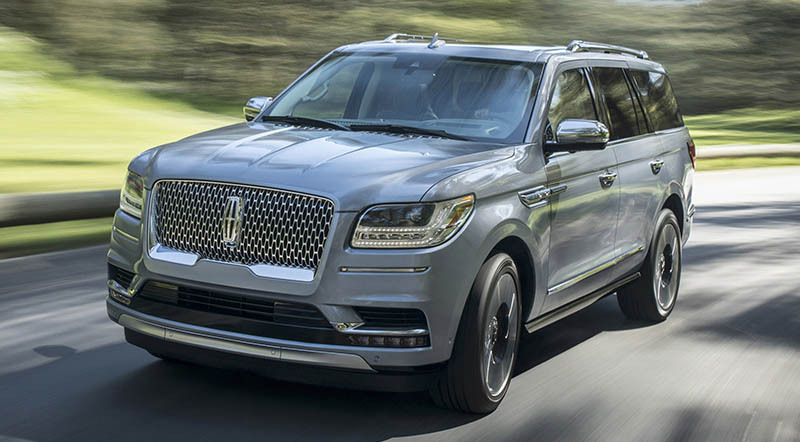 The automaker is yet to announce when the 2018 Lincoln Navigator will be available in the market, and the pricing details have not been revealed either.